Streamlight’s new Stylus Pro is one of a new breed of tactical flashlights designed for every day carry (EDC) as well as tactical use with weapons and equipment. These new flashlights by Streamlight and others are small, slim, tough, bright and long lasting. Founded in 1973 to manufacture tactical lights for the needs of law enforcement, emergency and military personnel, Streamlight Inc. has grown into one of the most trusted and successful manufacturers of quality tactical flashlights. The company is an active leader in the industry and helped to develop standards such as the FL-1 Flashlight Testing Standard, uniformly accepted by both American National Standards Institute (ANSI) and the National Electric Manufacturers Association (NEMA) as the governing standard for flashlight production and testing. This standard makes it easier for end users to compare features among various manufacturers and models, allowing more informed purchasing decisions by individuals and team provisioners. A look at Streamlight’s LinkedIn profile shows that viewers of Streamlight’s profile also viewed companies such as Glock, Beretta, Magpul and Trijicon, indicating that Streamlight’s products and marketing are engaging their intended markets. Streamlight says their product development teams gets “hands on” during its product development process. Company executives and engineers train frequently with law enforcement and emergency personnel. They spend time in the outdoors hunting, fishing, shooting and camping to understand the uses for their products in the field. Based in Eagleville, Pennsylvania, Streamlight is one of the top flashlight makers in the United States and around the world, doing business in more than 40 countries. Less than six inches long and about half an inch in diameter, the most accurate general description of the Streamlight Stylus Pro is “penlight”. This is a small, lightweight and rugged personal flashlight, designed for pocket carry or kept at the handy on equipment, gear and webbing. The Streamlight Stylus Pro is made from aircraft-grade hardened and anodized aluminum, providing shock resistance and the ability to withstand drops, being run over by a vehicle and other mishaps frequently encountered in the field. The lens is scratch-resistant polycarbonate. The C4 LED bulb is the current king of the industry with a rated 50,000 hours burn time. The end caps are sealed with O-rings to meet watertight standards such as IPX4 specification EN 60529:1992. The electronics package is designed and tested in accordance with the ANSI and NEMA FL-1 flashlight standards. The tail cap switch offers one-handed operation and includes momentary-on operation. The battery back consists of two AAA-sized alkaline batteries. Rechargeable batteries should work fine as well. The light is available in black, red, silver or blue, red camo and green camo. This flashlight’s pen-sized design and attached pocket clip make for easy carry in a pocket, attached to a collar lapel, cap bill or shoulder strap and it’s easy to add to any equipment loadout. The slim size and precision construction feel reassuring in the hand, and though you won’t be knocking anyone out with it, the C4 LED is plenty bright enough to temporarily blind an assailant if necessary. The long 6.25-hour runtime means that if it takes longer than you thought it would to get a vehicle off the side of a busy highway, there will be light enough to get the job done. The IPX4 waterproof rating means that when the Stylus Pro ends up at the bottom of a pool while wrestling down a suspect, you can dry it out and continue the mission. The lens is made of polycarbonate plastic and advertised as “scratch proof” by Streamlight. Many professions such as outdoor guides, rangers, soldiers and maintenance personnel may find that “scratch-resistant polycarbonate” is not the same as “scratch proof”. If you find that the rest of the light meets your needs, you may be able to adapt a glass lens from another light.The Streamlight Stylus Pro is light in weight, small and rugged in construction. The fact that there is no side switch could make it more difficult to find a trigger switch that will work with the light for rifle and handgun mounting, but the tail cap location may negate that minor drawback. The Stylus Pro should definitely be on the short list for the bugout pack, toolbox or glove compartment. 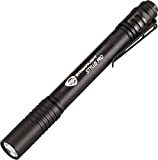 The Streamlight Stylus Pro is one of the most innovative, well built pocket flashlight that you can buy in today’s market. The only way this flashlight could be any better is if it was made in 6 different colors! I have found so many uses for mine that it has become a tried and true part of my everyday tools.